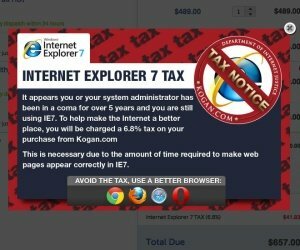 Bit Tech reports Australian consumer electronics store Kogan has introduced an "Internet Explorer 7" tax. In what seems like a brilliant marketing plan, the company decided to increase the cost of products purchased through the site via Internet Explorer 7 by 6.8 percent - 0.1 percent for every month IE7 has been on the market. The site gives IE7 users a warning screen and provides links to the Chrome, Firefox, Safari and Opera browsers for users who wish to avoid the tax. 'The way we've been able to keep our prices so low is by using technology to make our business efficient and streamlined. One of the things stopping that is our web team having to spend a lot of time making our new website look normal on IE7,' claimed company founder Kogan in a statement on the stunt. 'It's not only costing us a huge amount, it's affecting any business with an online presence, and costing the Internet economy millions.